Truly one of the great tragedies in rock (among a long list of them) was the disintegration and premature death at age 38 of David Byron. After being sacked from Uriah Heep in 1976 Byron recorded three uniformly excellent albums, all of which seemed to point towards fresh starts (these were 'Rough Diamond', 'Baby Faced Killer' and The Byron Band's 'On The Rocks'). That all of them sank with barely a ripple had more to do with lack of label support than any deficiency in material or performance. Each failure added to Byron's growing sense of hopelessness and fueled his seeming death wish alcoholism. Typical of Byron towards the end of his life is the story of guitarist Robin George meeting up with Byron at a pub to discuss forming a new band (The Byron Band) and finding him drunk and barely conscious in the gutter out front. Byron was always willing to try out new directions and sounds ('Baby Faced Killer', for instance, was unlike anything he had ever done, fusing quirky studio techniques, the odd disco beat and even World Music elements) and for these last known sessions from February 1984 he was again forging ahead into new and exciting territory. Kicking off with the Gary Wright penned "That Was Only Yesterday", Byron sounds in great voice. It lays to rest rumors that his drinking had destroyed his voice once and for all. Guitarist Tim Renwick contributes some nice textures and John 'Rabbit' Bundrick adds some keyboards that remind me quite a bit of the sound Steve Winwood gets on his song "Arc Of A Diver". The song is slightly repetitive but has a pleasing hook and wouldn't have been out of place on the radio of the era. Next up is the real highlight of this short E.P. "Waiting For The Sun" is of course a cover of the old Doors song and here is given a funky and equally moody turn. Alan Spenner's bass propells the song along and Byron is alternately authoritative and mysterious and solitary. When he sings, "Can you feel it now that spring has come/And it's time to live in the scattered sun", it packs an extra poignancy knowing that he would be dead within a year. The final track, "Pride And Joy", finds David in more familiar territory singing an old upbeat rock and roller with some swinging back up singing from The Chanter Sisters (who had previously worked with him on his 1976 solo album 'Take No Prisoners'). Rabbit contributes some fantastic Little Richard inspired piano and some wild organ runs, which adds to the pulsing energy of this lively track. Byron even hits a trademark high note here and with the feel good vibe and happy atmosphere it's as good a song as any to end a career on. He loved old rock and roll tunes and is so at home here and seems so assured and contented you hope this session gave him some small consolation in knowing he still "had it", even if record companies of the time didn't take notice. Yeah, as the session producer writes on the back of the E.P., "We could have made a great album like this, even had R & B, Motown, American songbook covers (so fashionable now). But sadly, all too soon, time stood still and it wasn't to be". On this brief (under fifteen minutes) final outing time does indeed stand still one more time. Luckily for us listeners, we can finally hear how great Byron sounded so near his final end--in his element, giving his all and happy. A fan written biography on Byron was titled "Born To Perform" and on the evidence here he remained an original performer until the end. Although these sessions were originally recorded in 1984, it was just this year (2008) that they were released for the very first time by CHA Promotions out of North Carolina. A big thank you goes out to them for this bittersweet gift. ps - My hat is also off to Mac Steagall and Ron Mann for making the investment in keeping David Byron's memory so alive! Got my copy today, very interesting style they choose to use, but David pulls it off great, and in fine form, never heard the Doors played like this before. Everything is well done, and its a bit sad as when its over your really getting warmed and ready for more, and to know that this was it, hurts a bit as he shows so much promise for his next step in music which he never got to take. On the positive side much hasn't been said about these tracks other than they were done, but at last we get to hear them, and we now know he was in fine form to the end of his much to short life, but again he has the ability to touch us all so long after he's gone, and bring us the joy we always had hearing him sing, and perform. To the CHA a big thank you for this, it deserved to be heard, and you made it happen, thank you!! Notes: As Ed said, the production is superb, very well balanced. Unlike what I was led to believe by Rabbit Bundrick several years ago, these sound very finished. Maybe it's the remastering, as the drums sound more late 70s than the real tinny sound of the mid 80s. The fake keyboard horns sound mid 80s, but they're not as up front as was too often the case on albums from the period. I love the cover art, BTW, Ron & Mac, the whole thing looks superb!!! 1. That Was Only Yesterday. This Gary Wright song sounds like it could've been on one of Elton John's early 80s albums such as The Fox. A laid back white R&B track with outstanding guitar work from Tim Renwick & equally outstanding keys from Rabbit. 2. Waiting for the Sun. My first impression of this Doors classic was not too good, as it's been rearranged somewhat. But knowing what to expect on the second listen, I was really into it. I'm now on my 3rd listen and can say that it holds it own with the Doors version...they're both equally good. Very funky with more killer guitar; you can really tell on the solos that this is the same guy who played those great solos on Year of the Cat. This could've been a huge hit in 1984 or 1985 if the album had been finished. 3. Pride & Joy. This Marvin Gaye classic reminds me of the poppy songs on David's first solo album with superb keys from Rabbit. Sounds more like gospel than R&B. You can hear the joy in David's voice. Priceless. Mail came early today. The CD is a mini EP in nice sleeve. I am listening to title track nice mellow tune with late 70s effects nice tune with horns and piano Track 2 has a cool funky opening then the haunting vocals kick in with some really hot guitar licks. The guitar comes and goes pretty cool. The mid part of the song kicks with some nice rhythm section. I love it first listen great track I am so excited my thumbs are flying!!! Yes typing like mad from the blackberry pda; Track 3 has an uptempo piano opening. I almost can hear him singing Kansas City here I come....they got a crazy little women and I'm going to get me some It is that type of old boogie rock. Chuck Berry meets Heep!!!! Awesome you guys dug up a diamond in the rough!!!!!!! Now I have to put down the Blackberry and get down to track 3. Get down!!!!!! WooHoo! Mine landed yesterday. Couldn't get it opened fast enough and into the car CD player. This thing is meant to be played loud and I did just that. The production is incredible, it sounds as if it was recorded yesterday but with a nod to 84. You two have done an incredible job with this release, a tribute to just how versatile David was as a lead vocalist. 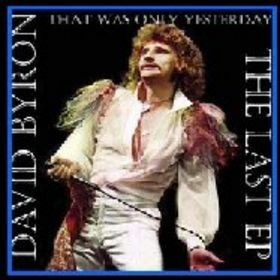 How cool is that David Byron material thought to be out of reach a short time ago has now been release in the same year Heep is to release a new studio CD and the Byron release hits the streets first! This one is going to get a lot of play time around here. Thanks to you both, Mac and Ron you guys have gone way above and beyond the call of duty and pulled it off beautifully! Thank you!